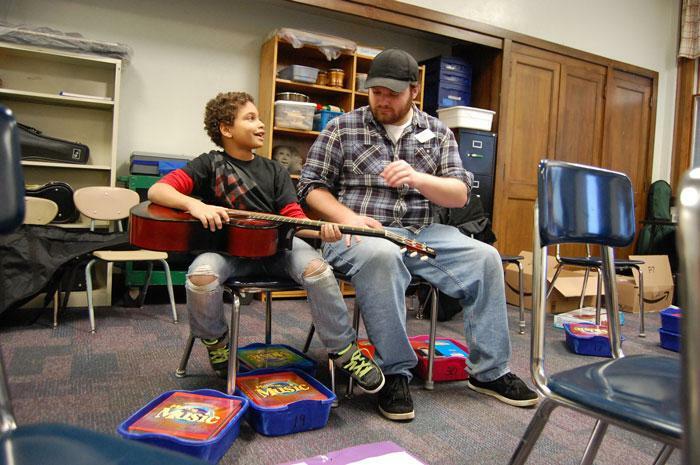 That nugget emerged at the last session of Composed, a project launched by Rachael Smith ’16 (music) that links Dickinson students with Carlisle’s LeTort Elementary School for an afterschool songwriting workshop. And it’s clearly something the youngsters enjoy. "When I grow up, I want to be a musician, and this has helped me get closer to my goal,” says Tamier Anderson, a 10-year-old romantic who seems to rely on the tried-and-true adage of “write what you know” in his compositions. “I like to sing the songs I've written, and I kind of write sad songs, songs about a broken heart." Tamier is one of 12 LeTort students who took part in Composed’s eight-week fall run, and his love of music echoes Smith’s own, which inspired her to launch the program. With its four instructors—including Elizabeth Johnsen ’17 (music, French), Jon Northridge ’16 (economics) and Dan Allegar ’17 (biology)—the program introduces the students to the piano, guitar, ukulele and bass, all purchased through an grant from Dickinson's Idea Fund, a student-run revolving-loan fund supporting social-entrepreneurship projects. Another community outreach project launched recently with the help of the Idea Fund is Project Storytime, a book drive conducted in conjunction with Carlisle’s Project SHARE, founded by Elaine Livas '83. “I was at the Emerging Leaders Retreat, and we were talking about how we can leave our mark on Dickinson and leave our legacy here while using our passions,” says Noah Thompson '17 (English, art & art history), founder of Project Storytime, an undertaking that came to him after a brainstorming session with the Idea Fund. The fund awarded Thompson a grant to have posters printed and provided him with valuable experience as an intern last summer. That experience was bolstered by another internship, this time with Project SHARE, where Thompson explored how to run a nonprofit organization, from the ground up. Project Storytime’s initial push was to collect books for Project SHARE’s annual holiday dinner, and Thompson reports that the drive was able to provide about 200 books for local families, with 200 more on the way from another donor. And now Project Storytime has been officially recognized by Student Senate, which means it can accept monetary donations, the lion’s share of which will go toward purchasing gently used children’s books from Pomfret Street Books, in downtown Carlisle.